1. We now have a total of 9 cats in and around the house. Trixie and Cooper are our inside cats. Trixie came to us in late 2016 and Cooper in late 2017. Outside we have Buster, Tommy, Mini, Cindy, Spike, Pepper and Ginger. The last 3 are kittens so we are looking to have them adopted. Rescuing cats does get pricey but what’s the alternative? Let them die? Our conscience can’t handle that. 2. Come next May I would be married 5 years and Rob has been here in Kuching for almost 4 years. We’ve gotten along fine most of the time but I will not deny it was a challenge in the beginning to experience living together for such an extended time. We were used to being together 3 months at the most during visits so it took some adjusting to each other’s quirks. So yeah 99 percent of the time we’re good and happy. Since there isn’t a perfect marriage, we are not without arguments or disagreements but we tend to work through them together. 3. Work is work. The only thing that saved me from just being completely burnt out was getting a promotion. I went through the process in 2017 and I received the confirmation letter in April. Of course alongside with a pay raise, it also means I have additional responsibility now and am expected to produce more. It was nice to get the promotion and feel like what I’ve done was validated. I guess the next thing to do is to get a PhD. 4. Family life is alright. I feel like I’m closer with my parents now particularly my mom ever since I moved out. I look forward to meet up with them and just talk and just to spend time together. It’s the first day of 2018 and I have to say it’s been a good start. We spent the whole day lazying at home, watching TV and even took a nap. These days I truly appreciate times like this. Durian always make me happy. 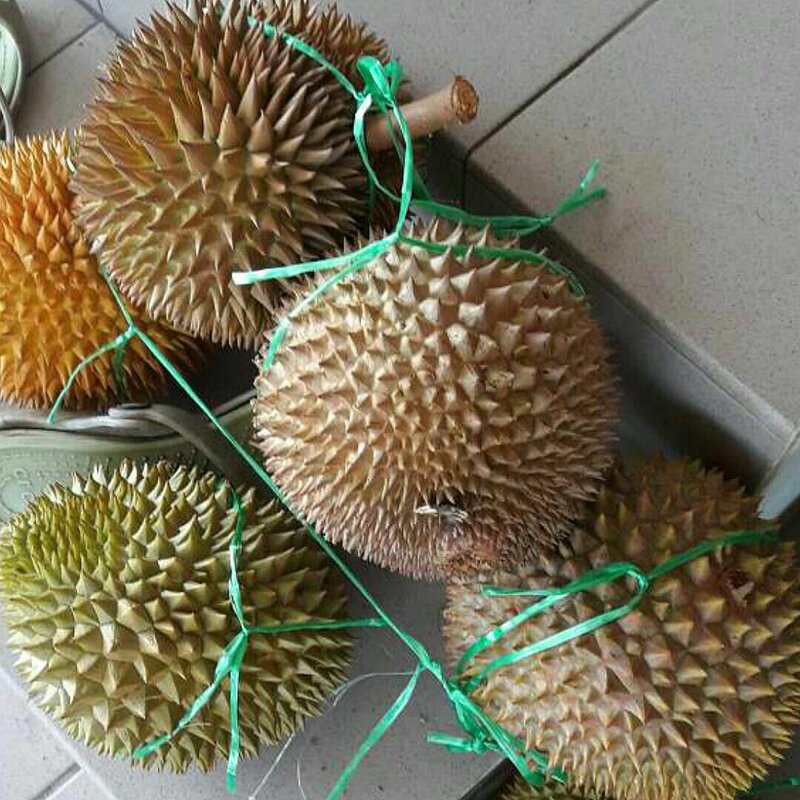 It seems that durian season is upon us. So many roadside stalls are popping up. Finally today, my dad bought some so I’m a happy camper. OMG it’s been forever since I thought to post on my blog. My last post was 2013?!?! So major changes in my life since then. We got married in 2014 in a beautiful intimate ceremony at the Chicago Botanic Gardens which was a dream come true. Then in 2015, Rob moved over to Kuching. Before he arrived I spent the previous 4 months prepping the house for our move. Two months after his arrival here, we had a wedding reception for family and close friends. And now our home has become a sanctuary for stray cats. LOL. Anyway I thought it was important that I posted something after all these years. And since I have the WordPress app on my phone now, it should be easier to update. In the world of smartphones, I’ve finally realized to download the wordpress app that is allowing me to blog via my phone right now. I’ve had a smartphone for a couple of years now. I just don’t utilize it to its full capability. Anyway quick update on what’s going on in my life. I visited Rob in Chicago last month and stayed there roughly a month. While I was there…he proposed!!! That’s all I got for now, bye! Yes yes, I have not written in eons so this is my obligatory year ender post. Like every other year, 2012 has been filled with ups and downs. Let’s start with the ups. Rob came to visit for 3 months, March-June. We went on our first out-of-the-country trip together to Phuket and had a blast, with a brief stop in KL. Phuket was FABULOUS! Definitely wanna go back again. Bought myself my first semi-pro camera, the Olympus Pen. It’s pretty awesome! Bought a house and it will be ready by end of 2013 or early 2014. Nothing fancy, just a simple double-storey intermediate terrace house. Damn real estate in Kuching is getting so expensive! Price went up 10k in a matter of 2 weeks. Full story on that some other time (This point is half an “up” and a “down”). It’s fun talking with Rob about what we want for the house, i.e decor, appliances etc. Finally got a computer at work so that means I don’t have to lug my laptop up 3 floors everyday. Got into the habit of going for morning walks before work when possible. Work bums me out sometimes, mainly due to the people I have to work with. Lacking weekends because it seems I’m working more on weekends these days. When I work weekends, it means I can’t sleep in as much as I used to. Issues of faith, which I shall not go into details here. Issues of spirituality…kinda related to above mentioned point. Anyhow, I’m going to head to bed before the fireworks go crazy but I think there won’t be much going on because it’s raining quite heavily right now. For that I am HAPPY! Happy New Year and have a fantastic 2013! Being good enough…does it really exist? For as long as I’ve lived I’ve battled the guilt of not being good enough, in every aspect of my life. Am I a good enough daughter? Am I a good enough girlfriend? Am I a good enough student? Am I a good enough employee? Am I a good enough believer? Am I a good enough person? But does being good enough exist? Despite my many attempts to be good enough (or try to be), I always realized that in the end that I tend to fall short. Is it because I’ve placed too high expectations on myself? Or is it because I think I’ve never been able to meet the expectations of others of me? In the end, does it really matter whose expectations they are? I mean we live in a world where humans (in general) are never satisfied with what they have. We always want more money, more things, more power, more clothes, more shoes, more popularity, more love, more looks, more spirituality, more kindness, more understanding, more patience, more talent, more faith…it goes on and on and on. If we are never satisfied, how can we ever be good enough for other people as well as ourselves? Are we humans doomed to chase the unattainable because there is no end to the “more…”? And if the “more…” is out of reach, when do we or should we even stop trying to be “more…”? If we stop trying, we’re not good enough but if we keep trying we’re not good enough either! So why bother trying when you know you’re going to get disappointed in the end? Perhaps I am being too pessimistic/negative. I will never be good enough. Period.